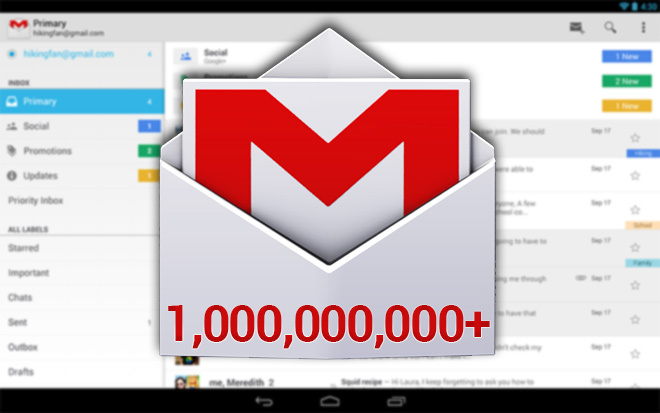 Gmail for Android now boasts over 1 billion downloads on the Google Play Store. Gmail is the first app to reach this milestone, after Google Play Services package, which is automatically installed on every certified Android device. The download counter reflects unique installs and not a total number of downloads, including repeats. Don’t think, however, that there are 1 billion active Android Gmail users, as there are most certainly some abandoned or duplicate accounts. Android boasted 1.5 million daily activations back in April 2013, and we’re definitely going to see a more updated figure on June 25, when Google I/O 2014 kicks off.